In 1960's, I had to travel to Kashmir valley as I was assigned to a training stint for a period of about 3 months. During those days, travelling to Kashmit valley was an arduous task. I had reached the railhead at Pathankot in Punjab state without much problem. From there I took a state transport bus to Jammu city. After reaching there I checked for the bus ticket for Srinagar, the state capital. 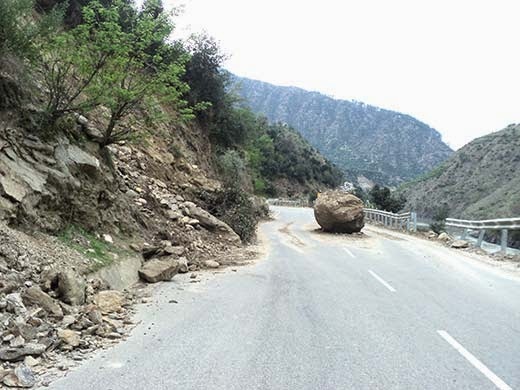 I was told that the Jammu-Srinagar highway has been closed because of a land slide. I had to wait for four days in Jammu staying at some dingy hotel and eating out on street Dhabas. It was incredibly hot in Jammu and only solace could be found in some air cooled theaters, showing some mediocre Hindi films. After four long days, I was told that the bus would leave next morning. I was happy and next morning left Jammu as dawn broke. I have faint memories of that travel, but what remains etched in memory are the bad roads, steep hills that appear to be touching the sky on one side of the bus and terrifyingly deep valleys on the other side. I had felt great admiration for the bus driver, who drove in those tough conditions almost every day of the year. During 1980's a decision was first taken to link Jammu and Srinagar by railway and work was started. It was declared a national project in 2002 and only then the work got speeded up. The 119 Km railway link in Kashmir valley proper from Baramulla to banihal was commissioned after many delays on 26 June 2013 only when 'Pir Panjal Railway tunnel' was completed. On the Jammu end of the railway line; even though the Jammu – Udhampur sector was completed in 2005 itself, a further extension up to Katra took another nine years to complete. Jammu to Katra line is now open for traffic. The 142 Km long section of the railway line between Katra and Banihal is still incomplete with work going on. 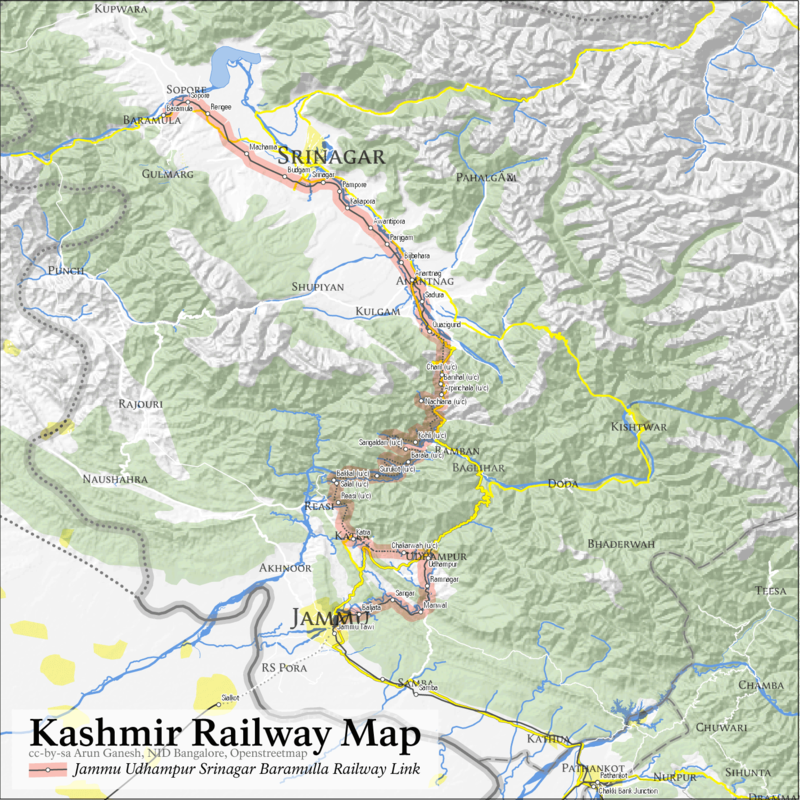 This perhaps is the most challenging sector of the entire railway line, as it is the most difficult section with seven Himalayan ridges lying between Katra and Banihal to be crossed and would require 62 bridges and multiple tunnels having a cumulative total length of 10 km out of this total 142 Km section. The terrain consists of some of the most spectacular but dangerous mountainous region of Jammu and Kashmir State. 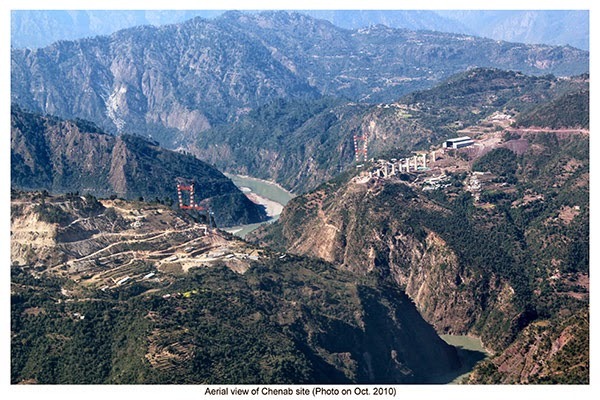 The line also has to cross here, one of the most formidable geographical features; the deep gorge of the Chenab river, so that sections of the line on either side of the river can get connected. 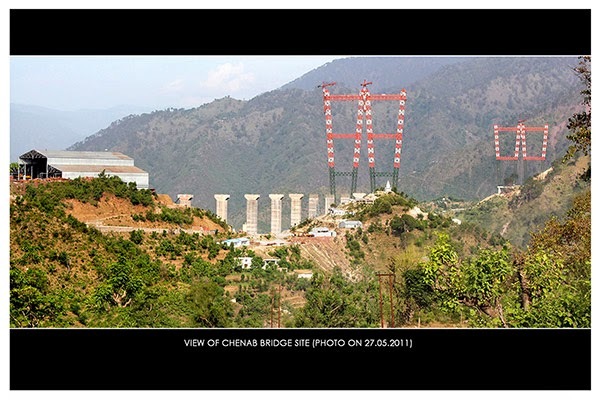 The work on the Chenab bridge had started in 2002 itself and was awarded to “Konkan railway Corporation, a subsidiary of state-owned Indian railways. 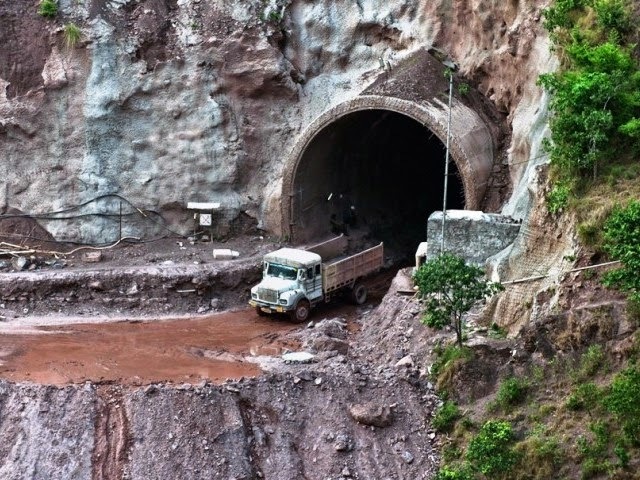 However in the year 2008, the Ministry of Railways ordered cancellation of the project on the existing alignment between Katra and Banihal, due to suspected geological instabilities and for safety and feasibility concerns, including the area's strong winds. It instructed Konkan Railway to stop all work on the section, including the Chenab Bridge, and to terminate all contracts issued for work on the section, pending consideration of major changes in the alignment. A high-level committee was formed to examine the feasibility of this sector and to rework the alignment through the Pir Panjal Mountains, proposing to undertake a fresh survey for construction of the line on a shorter alignment. In June 2009, the panel recommended that 93 km out of the approved alignment of 126 km between Katra and Banihal be abandoned. It also raised questions about the safety of the Anji and Chenab bridges. The railway board accepted the report and, by August 2012, it scrapped the Anji bridge. The high power committee set up to review the alignment however approved the existing alignment only with minor changes in June 2009 and the work on the section resumed, though some additional geo-technical tests of the rock strata and changes to other portions of the alignment changes were to be still reviewed. With this clearance, work on Chenab bridge also commenced. The railway board has been repeatedly censured by the Delhi high court, CAG and CVC for its half-hearted attempts to take corrective action,. In 2010, the high court held that the review had actually been "scuttled" by two board members who had been proponents of the flawed alignment. In 2011, the CVC advised the board to fix responsibility on the officers responsible for "project mismanagement". Finally, about a month ago, the high court directed the board to set up another expert committee as the previous one had failed to consider the alternative alignment. Despite such signals. 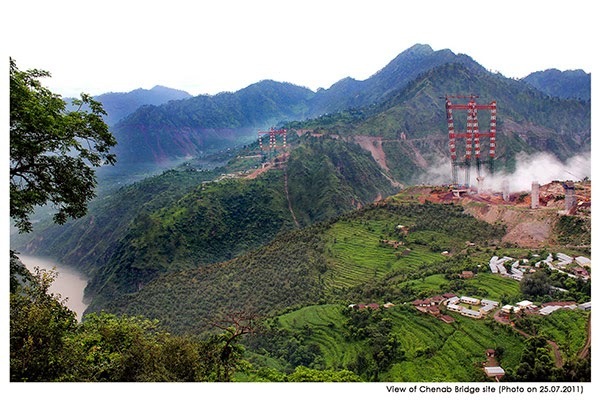 Leaving all this politics apart, the work on Chenab bridge, restarted in 2009 continues. The gorge of the Chenab river at this point is so deep that the bridge is expected to be 359 metres (1,177 feet) high above the river bed. It will surpass the world's current tallest railway bridge over the Beipanjiang river in China's Guizhou province, which stands at 275 meters high and would also be 35 meter taller than the Eiffel tower in Paris. The 1315 meter long simple span bridge with 17 spans will have a 469 meter long massive arch-shaped steel structure that will use up to 25,000 tonnes of steel. Weathering steel is planned to be used to provide an environment friendly appearance and eliminate the need to paint the bridge. The design of the bridge is such that it would withstand seismic activities and high wind speeds. The project will also require 4,000 metric tonnes of reinforced steel, 46,000 cubic meters of concrete and eight million cubic meter excavation work. The contractors have erected two cable cranes attached on either side of the river, secured on enormous steel pylons, because construction of the bridge without obstructing the flow of the river is the the biggest challenge faced. The arch is being constructed with help of these two cable cranes, that are largest in the world. Much of the material of the arch span would be transported by helicopters due to the tough terrain. Approach roads that reach the river bed level also had been built to reach the foundations of the bridge. Konkan Railway corporation hope to complete to work by 2016. That is not really far off in future. The bridge without any doubt is an engineering marvel and the full credit goes to the structural designers, who have designed it and to the Konkan Railway corporation, who are actually executing the project.